Page added in July 2007. When dealing with Itaca what immediately comes to mind is Odysseus/Ulysses, his wife Penelope and the extraordinary account of his travels and of her endurance. I am ODYSSEUS, SON OF LAERTES, who am in men's minds for all manner of wiles, and my fame reaches unto heaven. And I dwell in clear-seen Ithaca, wherein is a mountain Neriton, with trembling forest leaves, standing manifest to view, and many islands lie around, very near one to the other, Dulichium and Same, and wooded Zacynthus. Now Ithaca lies low, furthest up the sea-line toward the darkness, but those others face the dawning and the sun: a rugged isle, but a good nurse of noble youths. Itaca lies to the east of Cefalonia from which it is divided by a long and narrow channel. 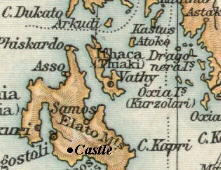 The island at one point becomes very narrow: the part to the north of the isthmus is "rugged Ithaca" where archaeologists have found foundations of very ancient buildings thought to be Ulysses' palace. However not everybody agrees on the island being that of Homer's poem, mainly because it is not "furthest up the sea-line toward the darkness" (toward the west). There is in the land of Ithaca a certain haven of Phorcys, the ancient one of the sea, and thereby are two headlands of sheer cliff, which slope to the sea on the haven's side and break the mighty wave that ill winds roll without, but within, the decked ships ride unmoored when once they have reached the place of anchorage. The description of a bay in the poem fits very well in the actual aspect of the bay of Vathi, in the southern part of the island. The Venetians regarded it as an excellent harbour: it was deep, ample and protected from winds. (The Phaeacians) Thither they, as having knowledge of that place, let drive their ship; and now the vessel in full course ran ashore, half her keel's length high; so well was she sped by the hands of the oarsmen. Then they alighted from the benched ship upon the land, and first they lifted Odysseus from out the hollow ship, all as he was in the sheet of linen and the bright rug, and laid him yet heavy with slumber on the sand. And they took forth the goods which the lordly Phaeacians had given him on his homeward way by grace of the great-hearted Athene. These they set in a heap by the trunk of the olive tree, a little aside from the road, lest some wayfaring man, before Odysseus awakened, should come and spoil them. Then themselves departed homeward again. Today Vathi is a small town at the southern edge of the bay. During the Venetian rule it was located in a more secure position on a mountain to the west of the bay. One of the most moving episodes of the Odyssey is that during which Penelope, who is still uncertain about the identity of the foreigner who bent Ulysses' arch and killed her suitors, orders her bed to be moved. 'Verily a bitter word is this, lady, that thou hast spoken. Who has set my bed otherwhere? Hard it would be for one, how skilled so ever, unless a god were to come that might easily set it in another place, if so he would. But of men there is none living, howsoever strong in his youth, that could lightly upheave it, for a great token is wrought in the fashioning of the bed, and it was I that made it and none other. There was growing a bush of olive, long of leaf, and most goodly of growth, within the inner court, and the stem as large as a pillar. Round about this I built the chamber, till I had finished it, with stones close set, and I roofed it over well and added thereto compacted doors fitting well. Next I sheared off all the light wood of the long-leaved olive, and rough-hewed the trunk upwards from the root, and smoothed it around with the adze, well and skilfully, and made straight the line thereto and so fashioned it into the bedpost, and I bored it all with the auger. Beginning from this bedpost, I wrought at the bedstead till I had finished it, and made it fair with inlaid work of gold and of silver and of ivory. Then I made fast therein a bright purple band of oxhide. Olive growing was key to the economy of Itaca at the time of Ulysses, when its oil supplemented the meagre diet of the inhabitants: its oil was also used as a sort of cosmetic and the Odyssey makes many references to people being anointed. The Venetians expanded the olive tree plantations; the excess production was shipped to Venice and even today the southern part of the island is almost entirely covered by these trees. They are small and they do not grow in height, by rather in width; the trunk gets larger and larger and then it splits into several trunks; by looking at some old olive trees around Vathi one becomes aware that Homer's account was a realistic one. Now at the harbour's head is a long-leaved olive tree, and hard by is a pleasant cave and shadowy, sacred to the nymphs, that are called the Naiads. And therein are mixing bowls and jars of stone, and there moreover do bees hive. And there are great looms of stone, whereon the nymphs weave raiment of purple stain, a marvel to behold, and therein are waters welling evermore. Two gates there are to the cave, the one set toward the North Wind whereby men may go down, but the portals toward the South pertain rather to the gods, whereby men may not enter: it is the way of the immortals. The cave which is thought to be that mentioned in the poem is not exactly near the harbour's head; the traveller who wishes to follow Ulysses' steps (he hid the gifts he received from the Phaeacians in the cave) must be prepared for quite a walk: while the cave is hardly inspiring (unless you are a speleologist), the view is definitely rewarding. According to a 1692 Venetian source the population of Itaca was 15,000, a number significantly higher than the current one (less than 5,000). When security became a minor worry the inhabitants of Vathi gradually chose to live close to the sea front (this occurred also on other Greek islands - see the ghost town of Megalo Kastro); earthquakes and in particular a very strong one in 1954 pulled down most of the abandoned dwellings: their stones were eventually used to terrace the ground which is now an olive plantation. One church continued to be cared for and it was not damaged by the earthquakes: its interior was decorated with frescoes, most likely a work of painters from Candia who left their island after the Ottoman conquest. In Orthodox churches an iconostasis (screen bearing icons) separates the altar from the nave: in this church a wall had the same purpose: it is an interesting mixture of Greek and Italian patterns: the higher part was decorated with portraits of Jesus, the Virgin Mary and St. John the Baptist between the Twelve Apostles; in the lower part there are larger paintings including a fine Madonna. The name of this cove is most likely a reference to the Saracens, the Arabs who raided the coasts of southern Europe for more than a thousand years. 'Now when the twain had taken their fill of sweet love, they had delight in the tales, which they told one to the other. * * *He began by setting forth how he overcame the Cicones, and next arrived at the rich land of the Lotus-eaters, and all that the Cyclops wrought, and what a price he got from him for the good companions that he devoured, and showed no pity. Then how he came to Aeolus, who received him gladly and sent him on his way; but it was not yet ordained that he should reach his own country, for the storm-wind seized him again, and bare him over the teeming seas, making grievous moan. Next how he came to Telepylus of the Laestrygonians, who brake his ships and slew all his goodly-greaved companions, and Odysseus only escaped with his black ship. Then he told all the wiles and many contrivances of Circe, and how in a benched ship he fared to the dank house of Hades, to seek to the soul of Theban Teiresias. There he beheld all those that had been his companions, and his mother who bore him and nurtured him, while yet he was a little one. Then how he heard the song of the full-voiced Sirens, and came to the Rocks Wandering, and to terrible Charybdis, and to Scylla, that never yet have men avoided scatheless. Next he told how his company slew the kine of Helios, and how Zeus, that thunders on high, smote the swift ship with the flaming bolt, and the good crew perished all together, and he alone escaped from evil fates. And how he came to the isle Ogygia, and to the nymph Calypso, who kept him there in her hollow caves, longing to have him for her lord, and nurtured him and said that she would make him never to know death or age all his days: yet she never won his heart within his breast. Next how with great toil he came to the Phaeacians, who gave him all worship heartily, as to a god, and sent him with a ship to his own dear country, with gifts of bronze, and of gold, and raiment in plenty. This was the last word of the tale, when sweet sleep came speedily upon him, sleep that loosens the limbs of men, unknitting the cares of his soul. L'isola (che da' Greci Thiachi, da' Turchi Phiachi vien detta e hoggidì Teacchi o Cefalonia piccola universalmente chiamasi) si numerosi ne riporta i nomi, quanti furono Auttori che la descrissero; Strabone, e Plinio Itaca la chiamano; il Porcacchi, e Dionisio Afro Nericia l'appellano; Niger Val di Compagno, e Soffiano Val di Compare la dicono. Questa nel sito riguarda la Cefalonia, da quale dividesi per spazio del Guiscardo, canale di gran fondo, lungo venti miglia, largo cinque, e tre nel più ristretto; ha la propria figura irregolare più longa, che larga; di copiosi anfratti è sparso il suo continente, e quaranta miglia vanta di giro; molti porti esibisce alla commodità de' legni, tra quali il più conditionato considerasi quello di Vathi, molto fondo, assai sicuro e meglio capace; a questo poco inferiori sono li due, l'uno di Gidachi, l'altro di Sarachinicco; altri pure ve ne sono, a quali non si riflette, perchè poco, o nulla vagliono. Fu creduta l'habitazione della casta Penelope, e Patria d'Ulisse; inde certe vestiggie di presente apparenti vengono venerate da Cefaleni come fragmenti della di lui habitazione; anticamente havea una Città nominata di Plutarco Alalcomene, hora tiene solo alquanti Villaggi, numerandosi per principali, Vathi, Annoi, Oxoi. Gl'habitanti arrivano al numero di quindici mille, buona parte de quali sono fuorusciti, ed esiliati dall'Isole del Zante, Corfu, e Cefalonia. Ogn'anno eleggono i Cittadini di Cefalonia un soggetto con titolo di Capitano di Teacchi, quale non và al possesso senza approbatione pendente dall'arbitrio de' Rettori, c'hanno obbligo di trasferirs'ivi alla visita ogn'anno una volta il mese di Marzo, nel quale solo si ponno trattenere, non essendosi l'auttorità di quel Ministro, ch'in ascoltar cause, e nella decisione delle diferenze, ch'occorrer possino. Andrea Morosini, Figlio di Pietro, quale nel 1622 fu Proveditore in Cefalonia, notifica esser stata levata quest'Isola da Collegati di Michiel Figliuolo dell'Imperatore Paleologo allo stesso Imperatore, e ad'un tal Carlo Tocco di nazione Napoletana. Persona si ben rassegnata alla Repubblica, che rimetteva al giudicio de' Veneti, com'a Supremi, l'appellationi di tutte le Cause, e criminali, e civili.